A wealthy patron is sponsoring a series of art exhibitions, and Hal Spacejock has been employed to transport valuable pieces from one venue to the next. The only question is which of them will last longest ... Hal or the artworks? 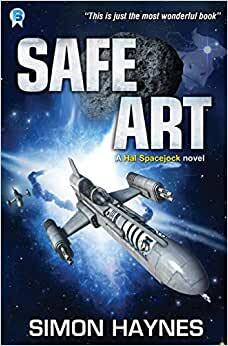 Safe Art is the sixth title in the Hal Spacejock series. Start reading Safe Art: (Book 6 in the Hal Spacejock series) on your Kindle in under a minute. And an Australian one at that! It seems that decent books in this genre are in short supply. The Hal Spacejock books are an easy read and gloriously B-grade in parts. 4.0 out of 5 starsBook 6 and still fun to read. Still fresh and fun to read. Hal and Clunk are at it again, this time they have help in the form of a Peace Officer. Harriet joins the fun as Hal and Clunk get the chance to handle modern art as cargo. Who would have thought that such adventure would come of moving modern art? Dive in and enjoy the new adventures of Clunk and Hal. 5.0 out of 5 starsExcellent entertainment. Diverting stories with very little use of foul and blasphmous language. Like the story plots and easy to read format. Very highly recommended author. Look forward to additional stories. I have read Simon Haynes' Spacejock series several times . . . what a hoot! Every novel of Simon's is worth waiting for -- his story telling art reminds me of the best of Twain, Stevenson, et al. The only reason he only gets five stars is because that's the limit. If you think you would be on the edge of your seat (slightly off rocker) careening down a mountain side, then you're in for a wild reading ride. But beware . . . the Haynes' legacy could give rise to a Spacejock tradition addiction. Very good read and safe for the younger teens. Simon Haynes nails it again with Safe Art. I'm so glad I found this series. Keeps the standard of the series. Great stories with humour throughout.